Can Aaron Judge become the third player to win a league ROY and MVP in the same season? One of the big stories (pun intended) of the 2017 baseball season is the New York Yankees rookie Aaron Judge. The six-foot-seven Judge currently leads the majors with 23 HRs, 60 runs scored, and tops the bigs in the on-base percentage stat. 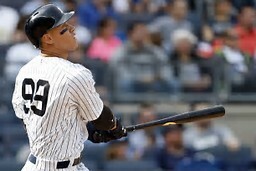 Judge, who plays the outfield, has been receiving attention as the odd-on favorite to win the A.L. Rookie of the Year this season and has been mentioned as a leading candidate for the league MVP. With the Yankees sitting atop the A.L. East, Judge has been a major reason for their resurgence this season and would receive significant consideration. Should Judge win the A.L. ROY and the A.L. MVP in 2017, he would become only the third player in baseball history to win both those awards in the same season. The others: Boston’s Fred Lynn in 1975 and Seattle’s Ichiro Suzuki in 2001. Let’s take a quick look at the players who won a league ROY Award and finished in the Top Five in the league MVP that same season. All total, there are 13 players who fit the category.